Limited Edition of 350 Copies on Black Vinyl! Chopped Herring had to return to Bushwick on the L train to drop "God Bless The Child" & "Truth Hurts All Colours", two previously unreleased (prior to the recent Herring CD drop), mid-90's joints on wax for the very first time and included are two classic Dysfunkshunal jawns for those of you, who haven’t managed to pick up the original yet!!! 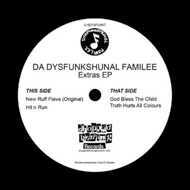 Always a pleasure to have Da Dysfunkshunal Familee aboard the trawler yo.